When you create your listing at Oregon Family Magazine, you reach our audience and automatically tap into a growing set of local marketing tools, powered by Locable™. Are you looking for more exposure? You can upgrade to a Premium Listing by contacting us directly. See below for more details. Include your name, address, phone number, website link, and hours of operation. Note: You can hide your phone number or address if you don't want those public. Your listing URL is search friendly and all content is indexable by Google including customer reviews and any events you post in the calendar. You can easily share your listing, events and even the reviews themselves! We love contests! Don't be surprised to see a contest in the future. When you have a listing, you have a chance to win! If you run or host events, you can post them in the calendar for free! Events at your business or venue are automatically linked to your listing which increases exposure and SEO! When you're business is tagged on one of our articles the content will appear on your listing. This leads to more locals finding you. Collect customer reviews on your listing and share to social media. You can also include customer reviews on your own website and automatically share them to your Facebook page when you upgrade to Locable's Marketing Platform. Paid listings are shown more prominently in the directory and includes other business details that help you stand out. The Local Spotlight is a special, high value, and automated way for you to promote your business to our audience. Premium Listings are shown every time someone visits our homepage! We shuffle the order so everyone gets exposure as the site grows! Highlight your social media profiles to drive followers and use link outs to direct potential customers to blog posts, articles and other media you care about. A Hero image gives you a supersized space at the top of your listing to show off your brand while a video can highlight your products, services or expertise. As you collect customer reviews you can set your favorite as a featured review for all to see. Can I post our upcoming events? Sure! Our Calendar and Directory are linked and events are free to post. Featured Events are also affordable! Can I ask customers to write reviews for my business? Sure! You can invite customers to leave reviews of your business and make it part of your standard post-sales experience. How much information can I put in my listing? All listings include core business information and you can always upgrade for more prominence and exposure. How can I promote my listing on the site? 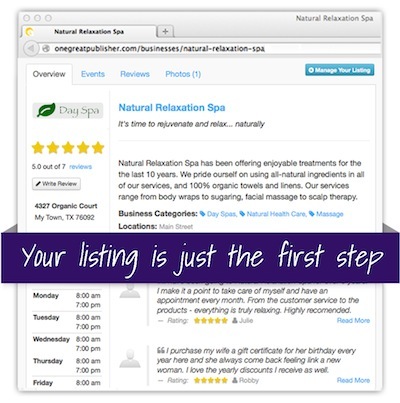 Upgrading your listing is the easiest way to promote your business as it will then be featured prominently in the directory while Premium Listings are also promoted on the homepage! Can I get help managing my listing? Absolutely! You can invite an unlimited number of Managers (employees, agencies, helpful family members, etc.). Can you help me promote my business in other ways? You bet! With our audience and reach, we can help you with advertisements, sponsored content, sponsorships, and more!